On Friday night, I went to Joe Harvard’s Rock ‘n Talk in Asbury. Joe had apparently told Mark that he had seen a church organ sitting on the side of the road somewhere down Bond St. Treasure like this is hard to leave alone. As soon as he told me, we were out the door. We didn’t have much in the way of directions. Bond St only goes in one way from where we started, but it goes on for a couple of miles until it hits Deal Lake. All we knew was that it was outside of a church. A waitress outside of Trinity and The Pope was having a cigarette. Mark says “ask her, she looks like she would know where the nearest church is”. “You think I look like I would know where the nearest church is?” she asked. Mark backed off for a second. “No that’s not what I meant. We’re just looking for a church on Bond Street”. Then he doubled down. “But maybe you do know where it is. Maybe you’re trying to trick us, and keep the organ they’re throwing away”. The waitress pointed to a building around the corner, saying she thought it might be a Mission of some sort. There didn’t appear to be an organ out front, so we decided that must not be it. We thanked her and moved along. At this point I started to despair. I told Mark that it’s crazy to think there’s just a free organ sitting on the side of the road, for the taking. There was probably a band setting up, and they must have just left it there momentarily while they were loading in. And it was starting to get to be that every building looked like it could be a church. I picked up the pace when I saw a large, aging brick building. That must have been it. Unfortunately, when we got there, it was just an elementary school. We decided we couldn’t keep going on foot. We walked back and got my car. Since this street is one way, going in the wrong direction, we went up Main St till about we hit the end, then came back down Bond, creeping along to make sure we didn’t miss anything. We did find it. 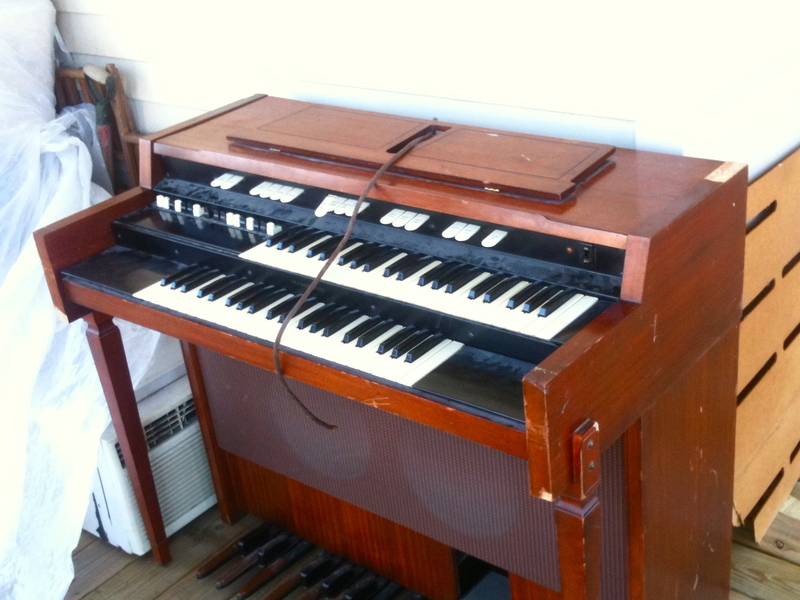 A Hammond organ. I’m no expert, but it looks old. The back had come off, and it looks like someone dumped a bag of asbestos in there, covering the tubes. The power cable had been cut. There was no way of knowing if this this still worked. It was clearly not going to fit in my little car, but ridiculous finds call for ridiculous measures. We planned to come back in the morning. The next morning, Mark and Keith go and stand watch over it. After several failed attempts, Erin and I found a U-Haul in Asbury that rented me a brand new cargo van (barely 7000 miles on it). Lifting that thing took all 4 of us. Right now it’s sitting on my porch, covered with a tarp. Eventually I’ll have to find someone who has some clue as to what goes on inside of these things. I sure hope they make house calls. Then I clear out a spot somewhere inside my tiny apartment. Look out for my all instrumental Hammond solo album due in fall of 2011.